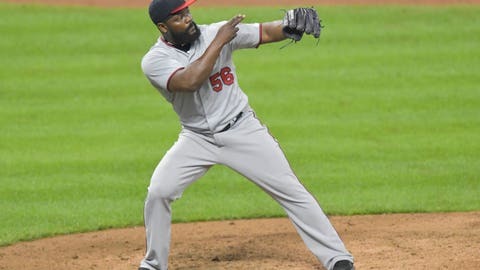 OAKLAND, Calif. — The Oakland Athletics have acquired closer Fernando Rodney from the Minnesota Twins. The A’s sent minor league right-hander Dakota Chalmers to Minnesota on Thursday to complete the deal that adds more depth to Oakland’s stellar bullpen. The 41-year-old Rodney is 3-2 with 25 saves and a 3.09 ERA in 46 relief appearances for Minnesota this season. The right-handed Rodney has 325 career saves, 17th most in baseball history. Oakland acquired former Mets closer Jeurys Familia last month to go along with Blake Treinen and Lou Trivino in one of baseball’s deepest bullpens. The 21-year-old Chalmers pitched five scoreless innings in two games for Class A Beloit this season. He is 7-7 with a 4.08 ERA in four minor league seasons with Oakland.